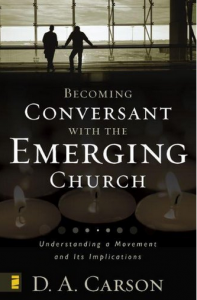 The sub-title is, “Understanding a Movement and Its Implications.” It was refreshing to read a scholar like Carson hold the “Emerging Church” writers’ feet to the fire. Carson takes the popular writers such as Brian McLaren, Robert Webber and Mike Yaconelli to task for their “nasty stereotypical” writing and for “condescendingly dismissing” older writers who would have ardently disagreed with them. Carson defends the traditional Evangelical position of absolute truth against the “experiential, participatory, image-driven, and connected—generating the acrostic EPIC, which has become a bit of a mantra [to the emerging church].” Carson writes fairly and with an even hand, but often asks questions such as, “To put the matter differently: Is there at least some danger that what is being advocated is not so much a new kind of Christian in a new emerging church, but a church that is so submerging itself in the culture that it risks hopeless compromise?” To which many of us say “Amen.” A voice such as Carson will be hard to dismiss.